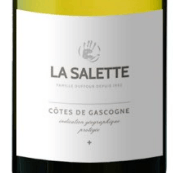 Domaine la Salette white wine, Fresh, clean and lively with intense exotic fruit aromas. Crisp, clean and zesty in the mouth, it offers delicate flavors of citrus fruit and grapefruit, and a long lingering finish. Since 1982, the Duffour family have developed high quality wines in the most beautiful territories of Gascony which brings the wines a typical and expressive character. La Salette through the traditional grapes like Colombard and Gros Manseng offers us a multitude of fresh notes, complex citrus, white and exotic fruits. It will be ideal for your appetizers as well as to accompany your seafood, fish or Oriental cuisines. Consumption: From appetizers to fish through to vegetables and others.